So we’ve come to it at last, the very end of the incredible Maiden England World Tour. Here’s our experience of the Bergen show, with a little helping of Knebworth Sonisphere as well. There’s nothing new to tell. The tour has been going for over two years. The setlist is known to anyone who cares. But all the same, a significant cycle in the history of Iron Maiden has now come to an end, and it’s time to take stock. CLICK HERE for our 2013 end-of-tour summary, at a point where we didn’t know that the tour would go into its third year in 2014. At long last Norway got a Maiden England show. It looked for a while like we would miss out on this particular concept, possibly because the not-entirely-successful 2011 The Final Frontier show in Oslo had cast a shadow of doubt over whether Norway was suited for another Maiden extravaganza so soon. Enter Bergen. Enter the Koengen Fortress. 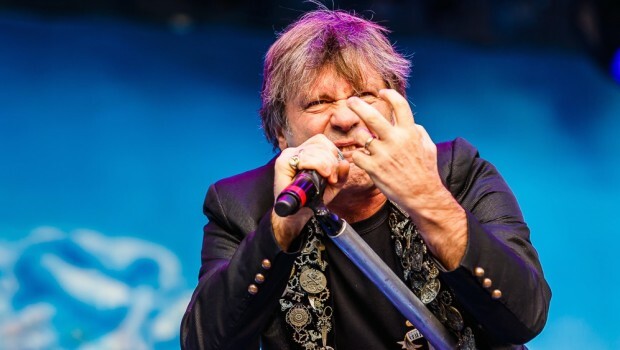 Maiden Revelations have seen a fair few shows on the 2012-14 tour, and we are of the clear opinion that the band sounds better at the end of the tour than they did in 2012 and 2013. Take that, Geoff Tate. Or Paul Stanley. 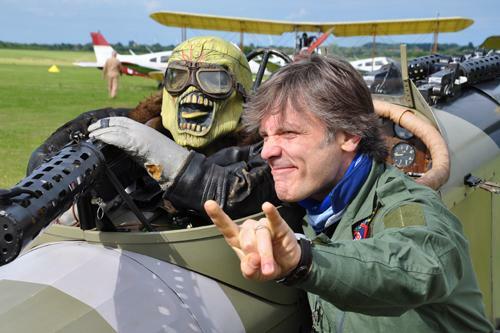 “Eddie was in the gunner seat on the Knebworth T-shirts, proclaiming “Fokkers at 6 o’clock”. And, true to his word, at 6pm that beautiful opening guitar figure to Paschendale came crystal clear from the Sonisphere main stage. Sepia film of replica First World War fighter aircraft being readied played on the big screens to an abridged version of Maiden’s trenches epic, and eight dots became visible on the horizon. A commentary told the crowd what we were looking at, and told us that Bruce was flying the last plane in the formation, a replica Fokker tri-plane, with Eddie in the rear gunner position! As the planes flew over the stage they broke up and began circling for targets. German and British planes engaged, sounds of machine gunfire rang out from the speakers, and streams of smoke showed where targets had been hit. 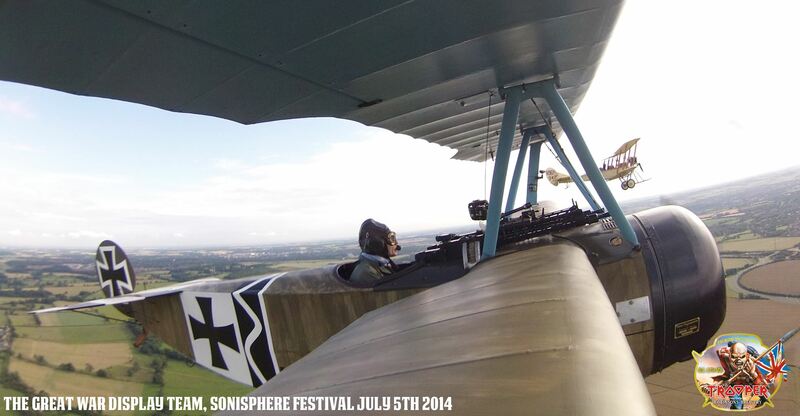 One plane remained apart, Bruce in his Fokker circling high above the action, waiting patiently for a mark. He shook off a Sopwith Camel and then, in a flash, was on the tail of a British plane. They engaged in what the commentator called a classic circular dogfight, and Bruce never let his target go. After 15 minutes, a military band appeared on the main stage and the Last Post rang out. There was one last flypast, and the planes disappeared off over the trees. Presumably Rod Smallwood and Steve Harris breathed a sigh of relief when that Fokker safely reached the ground. Bruce Dickinson. Iron Maiden. The triumphs and tragedies of human history. As fans of the band, we can hope for more tingles up the spine in the years to come. In THIS STORY you’ll find out that Bruce himself says Maiden will release a new album in 2015. And in THIS STORY Bruce talks more about writing that next album, smoking or not smoking dope, and keeping his incredible voice in shape. The voice that blew our minds in Bergen this summer. And probably will blow more minds next year. Here’s to the next Iron Maiden cycle! I was fortunate enough to see the last gig of the Maiden England tour and, even though I generally do not like festivals, I am glad I made the trek (it was indeed a trek from the car park to the arena! 😆 ) to Knebworth to see Maiden. The sound was really good from where I was standing, the band were on fire and they played a blinder. :rock: The pyro did not work in ‘Phantom of the opera’, but that was just a minor thing. Bruce gave a hint about future plans in ‘Sanctuary’, right after thanking the crew and us for making it all possible. He also mentioned that this was the “last gig in England… For a while”. But what is he saying at 0:53? “What’s coming is gonna make even more (…?…) for you in the few years to come…” ? Good to know that what is coming is gonna make even more real for me in the years to come.